An indepth look into how thoughtful, integrated designs embrace operational realities for revenue generation, enhanced guest experience and increased per cap spending. 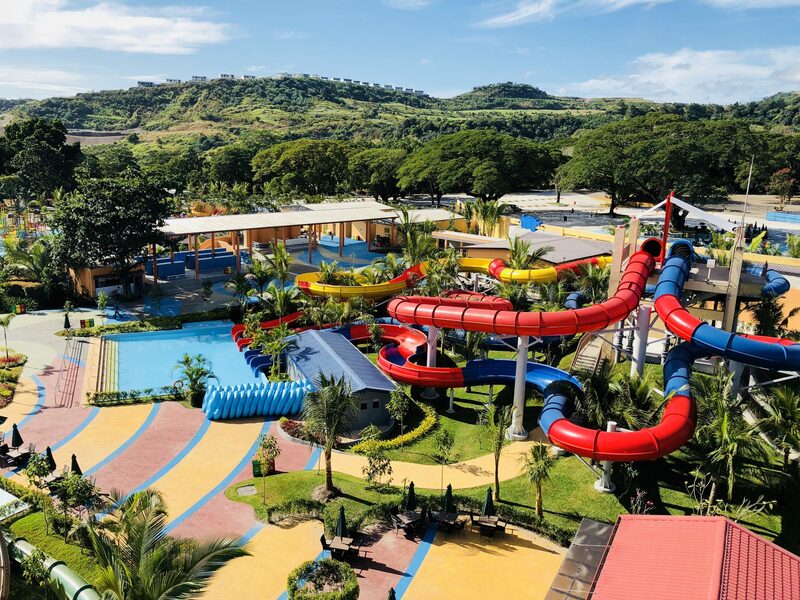 While vibrant splashes of color dotted through waterparks certainly entice patrons, the crux of a successful waterpark does not hinge on bold appearing slides and fancy graphics. Some park owners fall victim to the allure of an engaging slide package before considering the fundamentals of a well thought out waterpark design- the need to capture the eye of our guests and to capture the maximum profit capacity through the placement of attractions and revenue venues. Designing a waterpark that truly raises the guest experience and their spending potential involves the creative management of many factors. A designer must be intimately familiar with how waterparks are actually utilized by guests and operated by staff. A well-designed waterpark or related attraction expansion should efficiently direct increased numbers of guests while capitalizing on spending, allowing operators to manage guest activities with a smaller staff resulting in lower operational costs and yield a higher return on investment. Let’s say that you, as part of a park development team, have a site selected and you are ready to begin. Your feasibility study has provided a projection on annual attendance and guest capacity recommendations. 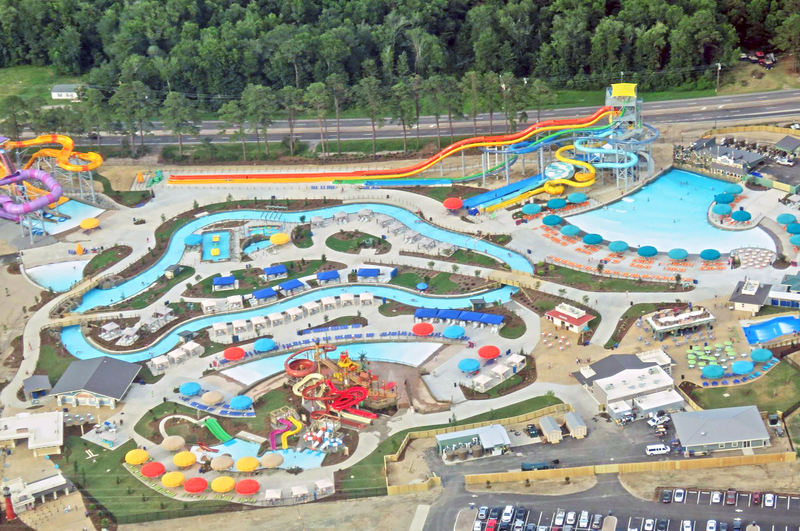 Now you are ready to choose a respected waterpark designer who will initiate big picture site diagramming that will be used to break the site down into major areas like vehicle entry, parking, drop-off, main gate, waterpark, operations, and service. The locations of these elements are driven by the site’s size and shape, topography, access to roads, views of the waterpark from highways, the ownership’s philosophy on operations, and the designer’s industry experience. Generally, two or three site diagrams will be prepared to explore the best arrangement of these program items. Many operational factors that prove integral to the final design are often ignored or downplayed in the conceptual phase. Parking comprises 40-50% of a standard park’s overall development area, far larger than any slide complex or mega wavepool. Although not flashy, circulation is a fundamental beginning to design, as well as more intricate details of the parking experience. For example, if parking fees are integrated into the business model, space for ticket/ control booths, vehicle queuing lane, and drop-off loop lane must be incorporated into the initial designs. Food, beverage, and retail opportunities are strategically located in each of these park designs to take full advantage of the deliberate circulation paths designed to move people through the park. Site conditions such as topography, roads, regulatory and natural buffers, and sight corridors should be evaluated. These factors typically help decide which site diagram to use for development into a workable plan. Your feasibility study gives the waterpark designer a target design-day attendance goal. These potential capacity numbers will drive the program of the waterpark in respect to its water features and support buildings. The building program, including front gate operations, cash storage, retail area requirements, food and beverage, park maintenance support and mechanical buildings, is developed in detail. Additionally, a designer will consider the sizes of these elements and how they could be organized with adjacencies or combinations to help consolidate utilities and staff requirements. Does your feasibility study address group sales? Will there be a separate entrance? Is there a dedicated area for large groups? Will they require additional food and beverage accommodations? Are there buyout spaces or features? Thus far, we have not yet discussed the mix of pools and water slides that will be incorporated into your waterpark. In fact, with the most successful plans, the early stages of design are actually less about the individual water features and more about organization and identifying site opportunities. ‘Pretty picture’ concept plans rely on trying to sell fiberglass and other attractions through vibrant colors and shapes, often resulting in the lack of consideration for functional necessities and park operations. Once the site diagram is appropriately determined and vehicular and pedestrian circulation are established, the fun begins. Each site and project have their own varied opportunities that require a customized effort. This is the moment for the multiple components to meld and the ‘pretty picture’ to be painted. Guest Lounge Areas are as important as pools and slides to overall guest satisfaction, experience and revenue generation. These areas are typically associated with large water bodies like the wavepool or multi-level activity pools. Keep large expanses of deck and signature attractions away from the front entry so you can draw guests deeper into the park and increase contact time with revenue opportunities. Promote circulation within the park by locating major features away from each other, creating destinations. This will disperse guests throughout the park and drive them past a variety of retail and food venues helping to increase passive patron experience and entice spending. Leave room for expansion when developing the plan leave a few areas where additional features can be added between existing attractions. This allows growth without increasing the overall footprint of the park. These develop-able spaces allow for renewed guest excitement and future marketing opportunities through exciting additions. The guest’s viewpoint should be paramount while designing the park. Imagine walking through the front entrance and note the attractions that first catch the eye. Are the water features completely hidden by vegetation? Is the food building turned so the façade is visible and inviting? Do the pathways allow for comfortable directional flow? Are the restrooms easily accessible? Are the park operations (cleaning and maintenance) distracting? Once the concept is organized, the features of the park are honed. During this phase of the design, vendor-specific slide, play structure, custom pool vessels and feature layouts are used. This consideration helps ensure that the right amount of space is reserved for the rides and pools as well as allowing for the addition of ride queues and tube corrals to properly support these features. 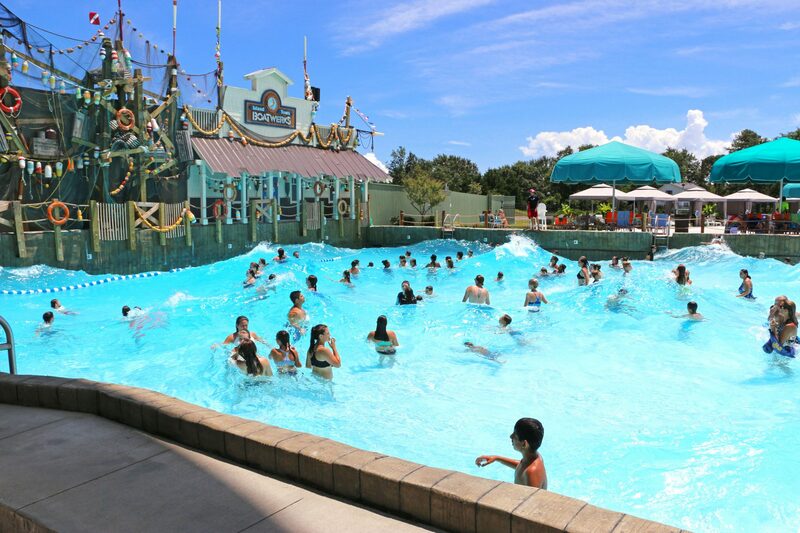 It is imperative to note that features where patrons are in the water, such as rivers, swim lagoons and wave experiences, often have higher capacity than waterslide complexes. Achieving a proper balance of in-water time to in-line time is key to the guest experience and to meeting guest capacity and spending goals. The staff that patrons interact with will have a profound impact on guest experience. While keeping operational budgets low, the staff expertise cannot be sacrificed. Additionally, a creative park design can consolidate the staff without losing necessary manpower. Ride Selection: Speed thrill slides are more staff intensive per rider than lower thrill rides. Feature Design: Wider and shorter rivers require fewer guards per rider. Building Design: Common kitchen areas can supply multiple serve lines. Mechanical Plants: Fewer locations keep staff working rather than moving around. 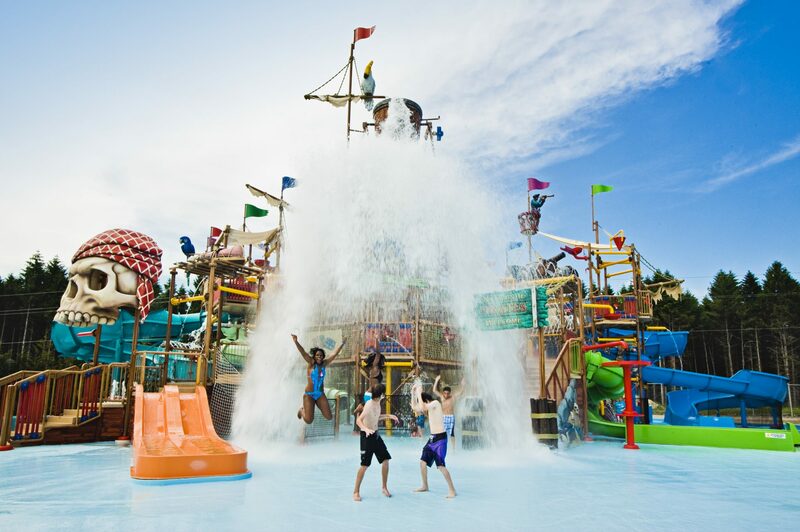 Many waterparks are designed inefficiently with water features driving the concept. A beautiful and guest friendly park starts with an overall understanding of the site and works into the details. By starting in black and white and slowly building in color, a park will find success both in guest experience and revenue generation.